Nestled on a quiet street in one of St. Louis oldest neighborhoods, The Franklin Room is a mix of old world charm and city vibes. Built in 1905, it boasts 30’ ceilings, 10’ windows and the original maple wood floors. With an attentive service staff that’s all about you, exceptional cuisine prepared fresh in house, and a wealth of support services and vendors, you have everything under one roof to get the party started. 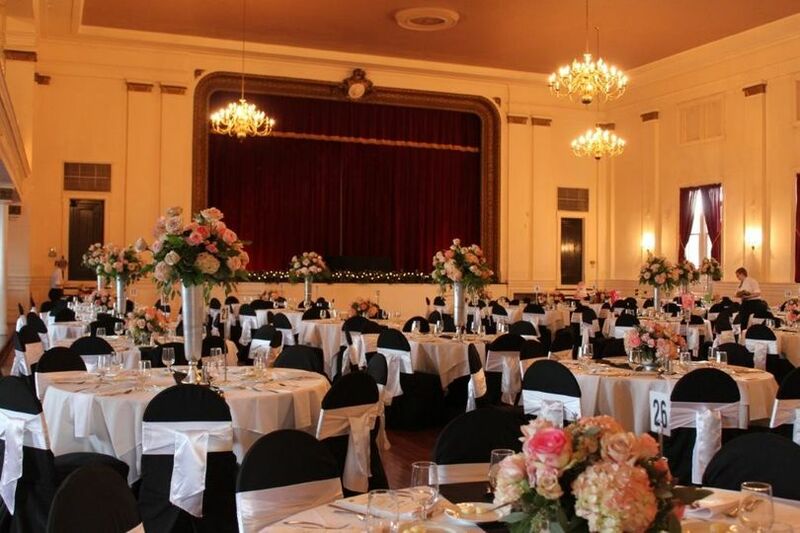 Add a bit of romance and this beautiful, vintage ballroom is the perfect place to celebrate your wedding day! We can't speak highly enough of this venue, the staff, and Michele and Doug. We used the space for our ceremony and reception, and it exceeded all of our expectations. The buffet dinner was incredible, and we have received so much positive feedback from our guests about how delicious the food was, the fast bar service, and friendly staff. Michele is incredibly kind and makes the wedding planning process very easy, which allowed us to relax and enjoy our day. Her list of preferred vendors was very helpful, and she was always responsive to our questions throughout the planning process. The space is beautiful without even decorating, so it took very little of our own touches to complete the look. We had such a blast at our wedding, and if we could do it all over again, we'd make all the same choices. THANK YOU to Michele and Chef!! We held our wedding reception at the Franklin Room two weeks ago and it was absolutely perfect! It is a large venue and very affordable. Michele and Doug Swaney are absolutely wonderful and conducted the evening and weeks leading up to it with the utmost professionalism. My husband and I are both foodies and we have tried a lot of roast beef, but we both exited the evening saying that theirs was the best we've ever had! Not only was the food incredible for the tasting, but it was just as good if not better the night of the wedding. All of our guests are still talking about how much they enjoyed it. One of the other things that made our experience there so wonderful was the attentiveness of Michele throughout the entire evening. When the bridal party arrived, before the introductions, she went through to everyone in the bridal party to make sure we didn't need anything and offered a glass of water to everyone. Throughout the night she just happened to be right there every time I needed her but wasn't in the way or overbearing at any point. Michele was also extremely helpful leading up to the wedding as she offered to set up all of the centerpieces and helped us figure out the best ways to decorate and organize the room. She also did a great job coordinating with all of our other vendors to make sure that everything went off without a hitch. Note: The Franklin Room has only been run by Doug and Michele for the past five years so any reviews from 2010 and before do not apply as it was under different ownership. A beautiful space with great service! Michele was wonderful to work with throughout the process. She was very attentive to details and truly went above and beyond to make sure that all the centerpieces and cake looked great. They provided the centerpieces(wreaths and ornaments) at no extra cost. We left behind a mistletoe ornament by accident after the wedding and came home on Christmas Eve night(two weeks after our wedding) to find it hanging from the doorknob of our front door. Michele had dropped it off at our house and it was a neat reminder of our day. They truly went above and beyond. We were pleased with the quality of the food and received great feedback from our guests. Additionally, we were quite excited to have our pick of any two beers to have on draft at the bar. We were able to select beers from our favorite local microbreweries at no extra costs and Michele coordinated it all. We highly recommend this vendor.